When I envisioned the game, it was a mix of Papers Please and a tower defense, with a dash of FTL thrown in. Because I didn’t have as much time as I wanted (and didn’t manage the time I did have well), the result is… not that. It’s a solid base for the game I imagined. Not having animations doesn’t hurt it much. It’s easy and kind of monotonous. How things work is unclear to the player. I would like to declare that I am in. I’ve been it a bit of a creative funk lately, so this should help. Technically, this is night 2, but I only had about an hour to work on it last night, so I’m not counting it. I am making a planet builder/sandbox game in which you have a list of actions to choose from and the order you choose them in affects how the world grows and develops. This is not something that hasn’t been done before, and, in fact, I’m drawing inspiration from a game I played a very long time ago called Sandbox of God. Ever since I played that game I’ve wanted to make something similar, so I’m doing it now. Anyway, on to the actual night 1 wrap-up. So far, I’ve finished the first “era” of actions. However, now that the groundwork is set, I should be able to finish several more eras before the deadline. I originally intended to have about ten eras, but that may be pruned down to about five for time. Hopefully the end result is a game people have fun playing. The game is growing ever larger. I wonder what this will grow into? Honestly, I don’t like the two button controls theme (it’s more of a limitation than a theme), so I’m glad that there’re two themes this time. There’s an idea percolating in my brain right now, we’ll see how it goes. This one didn’t progress as far as I would have liked, and it’s due entirely to my laziness. I spent several hours thinking about working on the game and then doing something else instead. Oh well, it’s playable at least. I made a turn based battle system from scratch. I hit my target number of different enemies and allies. I think I made a good choice in how enemy encounters work. No story of any kind. I didn’t do any balancing. Magic / Abilities – Every time you’d evolve you’d get a new ability or spell to use. Variety in enemy and ally attacks. An inventory more advanced than just 3 potions. A sidequest – I was going to hide some number of maguffins that when collected would let you fight a secret boss. Not only are the maguffins not present, there’s nothing to hide them behind either. Anyway, tell me what you think about my fire effect and what I might do to improve it. Anyone know of good, free software that turns videos into high quality gifs? Either that, or a program that can “record” parts of one’s desktop and save it as a gif. I actually managed to finish a Ludum Dare proper! Hooray! So, Bread Ninja. 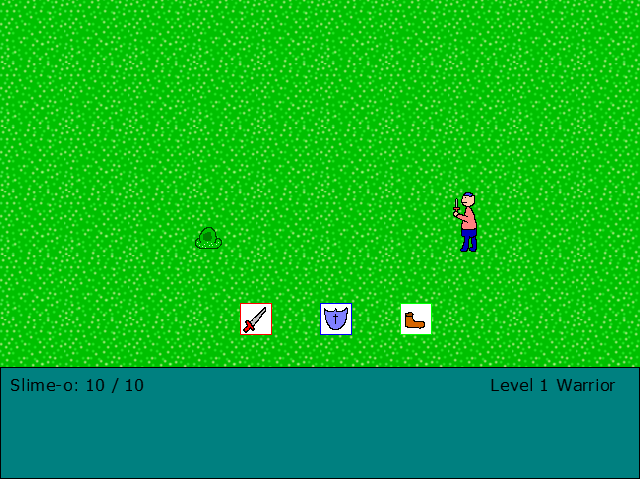 I finally got to use my “Baked Goods as Weapons” theme that I’ve thrown around a couple times on Ludum Dare. I got pretty much everything done that I envisioned for this project. I came into it smart, and cut down on the original idea I had, knowing it was too ambitious for a 48 hour Ludum Dare. I think I managed one of the goals I had as far as player choice. Do you use your weapons? Or do you eat them to regain health? I got to throw together a picture of a ninja with a bread slice breastplate, bread bowl helmet, and baguette sword. No sound of any kind, because I have no ability in the audio department. I had to cut the story bit from the actual game, because it wasn’t coming together very well, and time was running short.